The Israeli government's recent announcement of Army order No. 1,650 was just the latest act of provocation in a series of calculated measures to derail any possible resumption of peace negotiations. Under this new draconian measure, anyone who doesn't have a "permit" to be in the West Bank is to be considered an "infiltrator" and subject to expulsion or risk up to seven years in jail. Expulsions and deportations are not something new for the Israeli military administrative system which was established in 1969, shortly after the occupation of the West Bank, Gaza and the Golan Heights in the 1967 Six-Day War. At the time, the Israeli military was given the legal power to expel "infiltrators" without trial for various unspecified "security reasons." Two particular Palestinian communities will be impacted by order No. 1,650: Palestinians with Gaza residencies and Palestinians with East Jerusalem residencies, as well as foreign-born residents of the West Bank. But many Palestinian and Israeli experts believe that it's the foreigners living amongst Palestinians who are the real target of the Netanyahu government. Many believe that this is part of an ongoing Israeli effort to silence dissent and crack down on international solidarity members and activists who travel to Palestinian areas to support protests and rallies, often bringing with them the eyes of the outside world. Now that Israel has almost completed its "Separation Wall", it wants to build a "Wall of Silence" and control the flow of information and limit the presence of foreign-born eyewitnesses on the ground. The question is, why now? A "White Intifada" has begun to take hold in the West Bank and East Jerusalem. Every Thursday and Friday, Palestinian peace activists, accompanied by members of the Israeli Peace Now movement, as well as international supporters, gather to demonstrate against what they term as Israel's "Apartheid Wall" and land and home confiscations in the villages of Bil'in, Naalin, and the Sheikh Jarah neighborhood of East Jerusalem. Volunteers from B'Tselem( the Israeli Information Center for Human Rights in the Occupied Territories), document by video suspected violations of human rights by members of the security forces during those protests. Two months ago, I witnessed a Friday demonstration in Sheikh Jarah where settlers tried to provoke peaceful demonstrators by harassing and spitting on them while Israeli Police and border patrol units watched from across the street. I was impressed by the demonstrators' calm and unfazed demeanor. Similarly, at the villages of Bil'in and Naalin, peaceful demonstrators have been brutally beaten and arrested by the Israeli army. Nevertheless, more keep coming back every week. In February a Czech volunteer with the International Solidarity Movement was taken in the night from her house in Ramallah and deported by Israeli forces. This new order will give a blanket legal cover to the Israeli police and army to instantly deport foreign activists and aid workers spotted at demonstrations. 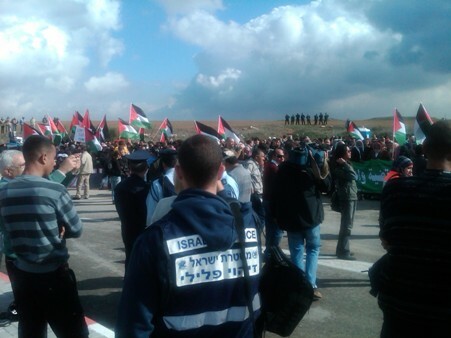 Last December, at another demonstration I covered at Erez (Gaza-Israel Crossing), Israeli police did not engage the peaceful demonstrators who gathered calling for an end of the siege on Gaza. Instead, policemen were busy videotaping those who showed up, especially foreign nationals. Interestingly enough my Israeli Press Card was indefinitely delayed for renewal after my coverage of that story, but that's another subject on its own. For years I've been hearing the popular question usually posed by Americans, "Where is the Palestinian Gandhi?" During the past two trips that I've made to the Palestinian territories and Israel, I think that I discovered him/her in the eyes of the many peaceful demonstrators against the Israeli occupation. Nonviolent resistance could be the biggest threat to Israel's ability to justify it's continued military aggression and occupation of Palestinian lands. Order No. 1,650 is to neutralize the movement by deporting Gandhi. Watch the Mosaic Intelligence Report!